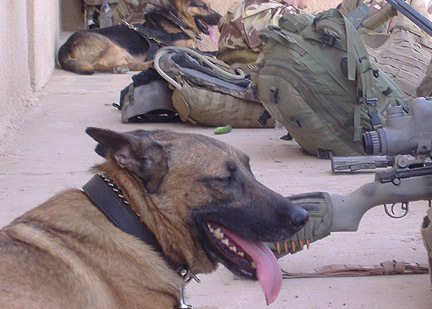 Animal Friends: Remembering all our veterans this weekend: two and four-legged. Remembering all our veterans this weekend: two and four-legged. This Memorial Day weekend we all remember the men and women who have served and died fighting for our country. I will also reflect, with immense gratitude, on our furry soldiers who charged into battle on four paws. Especially the canine heroes who kept my great friend and brother-in-law, Neal, safe. Neal served in the Army's Special Forces in Iraq. When two American soldiers were captured by the enemy, Neal's highly trained unit, along with a few German Shepherds and Belgian Malinois, were sent to rescue the men. Some of the dogs were trained to follow a human scent. The others sniffed out the highly dangerous and deadly improvised explosive devices, also known as IEDs. "They detected the bombs that were placed by the kidnappers and we were able to avoid being killed," Neal told me. On a sadder note, the dogs brought the unit to the remains of the soldiers. They were recovered and brought back home to their families here in the US, possibly giving them some closure. I know I just summed up an extraordinary story in a few sentences, but I want readers to know that I and many others are overwhelmingly thankful for these brave members of the armed forces. "I have a great deal of respect for these dogs and their handlers," Neal remarked. Plus, I have a feeling they provide some much needed moral support. "I was pleased to have these dogs with us simply because I love dogs," Neal said. Happy Memorial Day to all of our friends, two and four-legged.